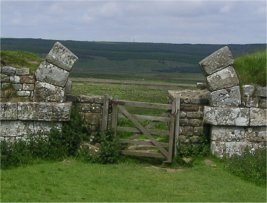 There are so many interesting places in the North of England connected to the old Roman Empire. These include Hadrian's Wall, Housesteads fort, Chesters fort, Segedunum at Wallsend, the settlement at Corbridge and Vindolanda. During excavations at Vindolanda some years ago, they found some wooden tablets that turned out to be the equivalent of Roman postcards. Their contents range from birthday invitations to inventories, and give a real insight into the people who lived in this area over 1900 years ago. In 2002 a BBC TV programme voted the Vindolanda tablets the most precious item in the British Museum, because of what they tell us about our ancestors. Check out the BBC page on Vindolanda, or check out the Vindolanda tablets online. You can even see the reference to Brittunculi on tablet 164.